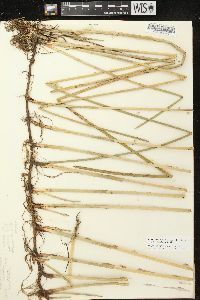 Plants perennial, mat-forming; rhizomes evident, long, 1.5-4.5 mm thick, firm to hard (or soft), cortex persistent, longer internodes 10-35 mm, scales usually persistent, 6-20 mm, membranous, sometimes slightly fibrous. 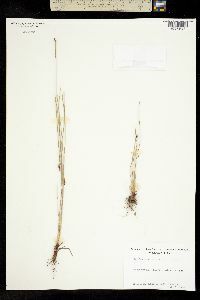 Culms terete or slightly compressed, often with 8-30 blunt ridges when dry, 30-115 cm × 0.5-5 mm, firm to soft, internally spongy. Leaves: distal leaf sheaths persistent or sometimes disintegrating, often splitting adaxially, red or blackish proximally, green or red distally, not inflated, not callose, membranous to papery, apex broadly obtuse to acute, tooth absent. Spikelets ovoid to lanceoloid, 5-25 × 3-7 mm, apex acute to obtuse; proximal scale clasping 2/3 or sometimes 3/4 of culm, entire; subproximal scales 1-2, empty; floral scales often spreading in fruit, 30-100, 4-8 per mm of rachilla, brown, midrib regions mostly stramineous to green, ovate to lanceolate, 3-5 × 1.5-2.5 mm, apex entire, acute or subacute, often carinate in distal part of spikelet. 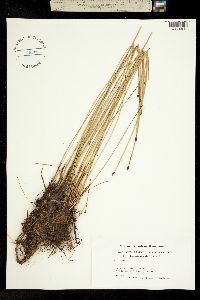 Flowers: perianth bristles 4(-5), sometimes absent, medium brown to stramineous, slender to stout, much shorter than achene to equaling tubercle, rarely to 2 times as long as achene; stamens 3; anthers dark yellow to stramineous, 1.5-2.2 mm; styles 2-fid, very rarely some 3-fid. Achenes not persistent, stramineous or dark brown, biconvex, angles obscure, obovoid to obpyriform, 1.1-2 × 1-1.5 mm, apex rounded, neck absent or mostly short (to long), smooth at 30X, sometimes finely rugulose at 10-20X and with 20 or more ridges in vertical series. Tubercles brown to whitish, pyramidal to mamillate, as high as wide to 2 times higher, 0.3-0.7 × 0.35-0.7 mm. 2n = 16, 17, 36. Fruiting summer. Fresh (to slightly brackish-) marshes, meadows, shores, ponds; 0-3000 m; Alta., B.C., Man., N.B., Nfld. and Labr., N.W.T., N.S., Ont., P.E.I., Que., Sask., Yukon; Ala., Alaska, Ariz., Ark., Calif., Colo., Conn., Del., D.C., Ill., Ind., Iowa, Kans., Ky., Maine, Md., Mass., Mich., Minn., Mo., Mont., Nebr., Nev., N.H., N.J., N.Mex., N.Y., N.C., N.Dak., Ohio, Oreg., Pa., R.I., S.Dak., Tenn., Tex., Utah, Vt., Va., Wash., W.Va., Wis., Wyo. ; Mexico; Eurasia; New Zealand. 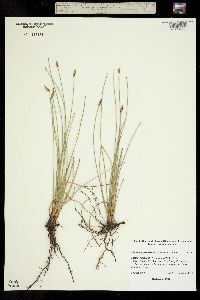 Eleocharis palustris is the most widespread and common species of the extremely difficult circumboreal 'E. 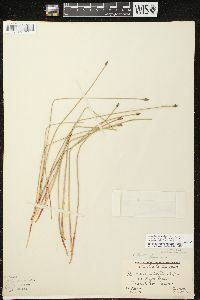 palustris complex,' which in North America comprises E. palustris, E. mamillata, E. macrostachya, E. erythropoda, E. uniglumis, E. kamtschatica, and E. ambigens. Two or more of these species have been combined by recent authors. The complex has been studied extensively only in northern Europe (S.-O. 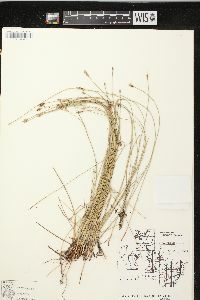 Strandhede 1965, 1966), where E. palustris, E. mamillata, and E. uniglumis are recognized (S.-O. Strandhede 1966). European studies and preliminary studies in North America by S.-O. Strandhede (1967) and L. J. Harms (1968) indicate that unstable chromosome structure and number as well as interspecific hybridization contribute to the taxonomic complexity of the E. palustris complex. Eleocharis palustris is extremely variable worldwide. Recognition of infraspecific taxa outside northwestern Europe is premature. For northern Europe, S.-O. 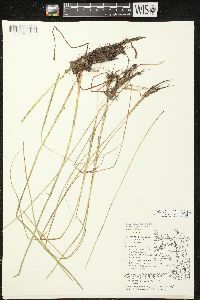 Strandhede (1966) recognized E. palustris subsp. 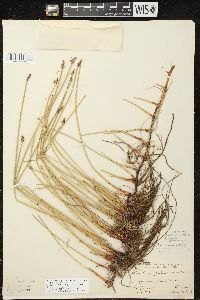 palustris, with two varieties, for which the chromosome numbers 2n = (14-)16(-17) have been reported, and E. palustris subsp. vulgaris, without varieties, for which the chromosome numbers 2n = (33-)38-39(-40) have been reported. 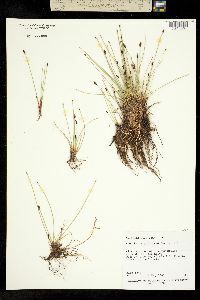 Eleocharis palustris subsp. vulgaris is morphologically intermediate between E. palustris and E. uniglumis and may be of hybrid origin. 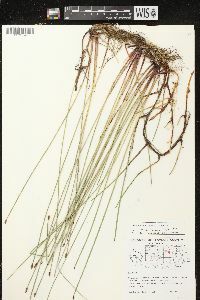 Its North American counterpart appears to be the polyploid populations of E. macrostachya (variants b and c, at least in part), as defined herein. For North America, S.-O. 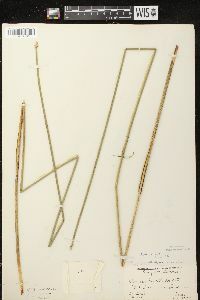 Strandhede (1967) and L. J. Harms (1968) recognized two 'cytotypes' among the plants with the morphology of E. smallii, one with 2n = 16 (variant a below) and one with 2n = 36 (variant c below). Much of the variation in habit is undoubtedly because of modification of the phenotype by environmental conditions as described for Europe by S.-O. Strandhede (1966). 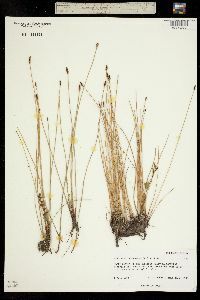 The more robust plants are often emergent in open water and may be called 'crassa' phenotypes; the more slender plants often grow in densely vegetated marshes and meadows and may be called 'meadow' or 'grassland' phenotypes. 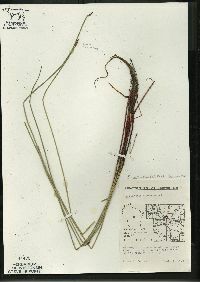 Intermediates between E. palustris variant b (below) and E. erythropoda are common in zones of sympatry. At least 4 variants are notable in North America. 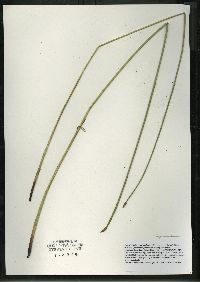 Variant a (Eleocharis smallii in the strict sense) has culms mostly 1-3 mm wide; distal leaf sheaths sometimes disintegrating, often splitting adaxially, summits often with red margins, apices obtuse to broadly acute; floral scales 3-4 mm; achenes to 1.5(-1.6) mm; culm stomates 39-48 µm (based on very few measurements). Reported chromosome numbers for which I have seen vouchers, all from Kansas, are 2n = 16, 17 (L. J. Harms 1968). The range of variant a is mostly northeastern, where it is known from elevations to 1700 m in Newfoundland, west to Manitoba and south to North Carolina, Kentucky, Missouri, and Kansas, with one collection from east-central Alaska. Variant b is similar to variant a and intergrades with it. 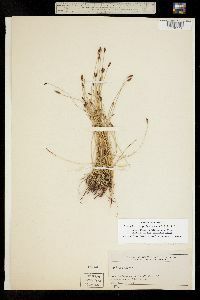 It has culms only 0.5-1.2 mm wide; distal leaf sheaths persistent and not splitting, summits usually with markedly red margins, markedly oblique when viewed from the side, apices acute to narrowly obtuse; and spikelets with proximal scale often clasping 3/4 of the culm. At least some of these slender plants may simply be meadow or grassland forms produced by the direct effects of unfavorable enviromental factors such as competition. Variant b is mostly sympatric with variant a; it is more common in the Southeast, where it is known south to Louisiana and Arkansas. Plants from the more southern part of the range are especially striking because of their extremely oblique, brightly red-margined sheath summits and proximal floral scales usually clasping to 3/4 of the culm. 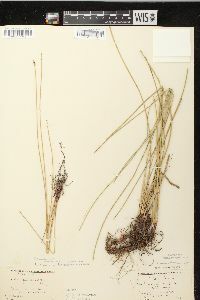 Variant c may be called Eleocharis palustris var. vigens L. H. Bailey. The lectotype is from the shores of Lake Champlain in Vermont (S. G. Smith 2001). It is similar to unusually robust forms of variant a, from which it differs in that its achenes are 1.6-2 mm, culm stomates 52-65 µm, and floral scales mostly 3.5-4.5 mm. Because of its large achenes and stomates, variant c is assumed to be tetraploid with 2n = 36 (S.-O. Strandhede 1967; L. J. Harms 1968). Variant c apparently grows mostly as an emergent in open water to about 1 m deep. Its known range is northeastern, from Newfoundland and Labrador to Manitoba, south to New York, Michigan, Wisconsin, and Nebraska. Variant d comprises most of the plants that cannot be placed in the preceding variants. 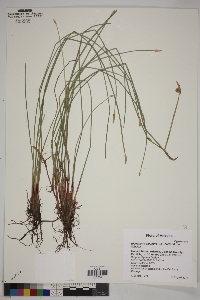 Most of these plants closely resemble most specimens that I have seen from northern Eurasia and as described for Eleocharis palustris subsp. palustris by S.-O. Strandhede (1966). Variant d has distal leaf sheaths often splitting or disintegrating, the summit margins not reddish, and apices usually broadly obtuse. In North America variant d is mostly subarctic and boreal; it is known from Newfoundland and Labrador to Alaska, south to New York, Wisconsin, Minnesota, Iowa, New Mexico, and California. 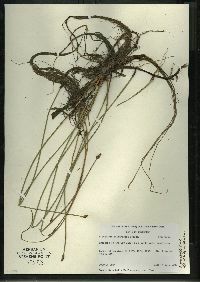 Some plants of variant d that have markedly narrow tubercles mostly much (to 2 times) higher than wide and narrow achenes only 0.9-1.1 mm wide may deserve taxonomic recognition; they are known from Manitoba west to British Columbia and Alaska, south to Colorado, Utah, and California. 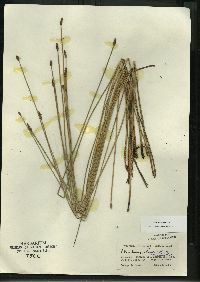 Specimens of variant d from scattered western localities from Alaska and Yukon south to California have floral scales 4-5 mm and achenes 1.6-1.9 mm and are very similar to variant c.
Perennial herb with long slender rhizomes, mat-forming 30 cm - 1 m tall Leaves: reduced to bladeless sheaths, basal, two per culm, margins fused and enclosing culm, often splitting, reddish or blackish basally, green or reddish above, with a blunt to pointed apex, membranous to papery. Flowers: minute, spirally arranged on the axis of the spikelet, lacking sepals and petals, with zero or four bristles, subtended by a scale. Bristles (when present) pale brown to straw-colored, shorter than to equaling the achene, rarely longer, slender to stout, shortly barbed. Stamens three, exserted. Anthers yellow to straw-colored, 1.5 - 2.5 mm long. Pistil one. Style two-cleft, rarely three-cleft. Fruit: a one-seeded achene, straw-colored or yellow to medium brown, 1 - 2 mm long, 1 - 1.5 mm wide, lenticular (lens-shaped), smooth (at 30X) or finely wrinkled (at 10 - 20X). Tubercle brownish to whitish, to about 0.5 mm long, narrowly conic to depressed pyramidal, constricted basally. Seed with a thin, non-adherent wall. Culm: unbranched, 30 cm - 1 m long, 0.5 - 5 mm wide, circular in cross-section or slightly compressed, often eight- to thirty-ridged when dry, spongy inside, enclosed basally by two fused sheaths. 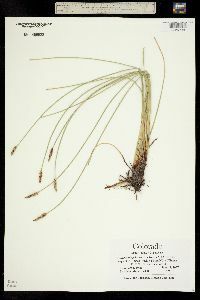 Spikelets: solitary, 0.5 - 2.5 cm long, 3 - 7 mm wide, egg-shaped to lance-shaped with a blunt to pointed apex, with 30 to 100 floral scales. Scales spirally arranged and overlapping, brown with a straw-colored to green midrib, 2 - 5 mm long, 1.5 - 2.5 mm wide, egg-shaped to lance-shaped with a more or less pointed apex. Habitat and ecology: Rare in the Chicago Region. 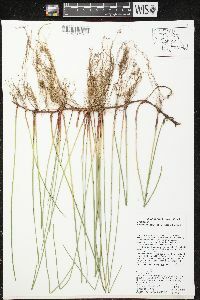 Found in moist areas, typically along ponds, streams, marshes, and sloughs. Etymology: Eleocharis comes from the Greek words heleios, meaning "dwelling in a marsh," and charis, meaning grace. Palustris means "marsh-loving." In muddy, peaty or wet, sandy places in ditches, sloughs, ponds, marshes, and like habitats on the borders of streams and lakes.